as conductivity probes in order to assess the conductivity of water (an important water quality measurement). Another note on the video: I seem to have referred to pretty much every piece of metal in the set up as a 'jack'. Will proceed to refer to everyone I meet today as Jack. And I plan to solicit comments on the above video from Jack Summers. Need to find a nice way of measuring out known amounts of salt. Cheap microgram scale? Set up a basic 555 timer conductivity measurement circuit using an audio jack. is the audio jack leaking? or is this the DC ion channel build up problem you were worried about? 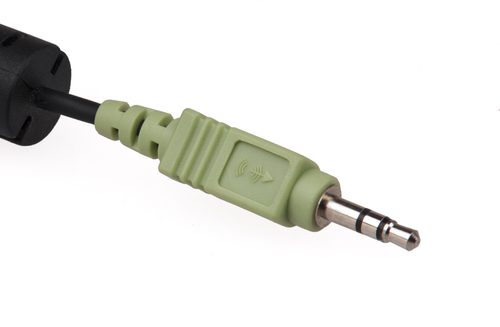 An audio plug like the one you're using could easily make a good standard electrode. I have two suggestions that may help. FIrst, use a gold plated plug. The gold will have far less problem with corrosion (and possibly eletrolytic effects) than the standard quality plugs. Second, for tests, try using distilled or de-ionized water for the low conductivity tests and use contact lens saline solution as the high conductivity media. Saline solution is pretty much standardized and easily available. I'm not surprised to see the slowly increasing resistance at the start of the video. Current in water is carried by ions: OH or, with salt added, Na and Cl ions. You're right about the medium becoming polarized. The few ions in pure (or even tap) water would be getting pulled to the positive and negative contacts.